Hopefully today's liner-off provides ideas and insights into the five contenders today: NYX Slide On liner (Brown Perfection), Stila Smudge Stick (Damsel)(In the Light palette exclusive), Rimmel Soft Kohl (Jet Black), Revlon Colorstay eyeliner, and Wet n Wild Color Icon eyeliner (Charcoal). 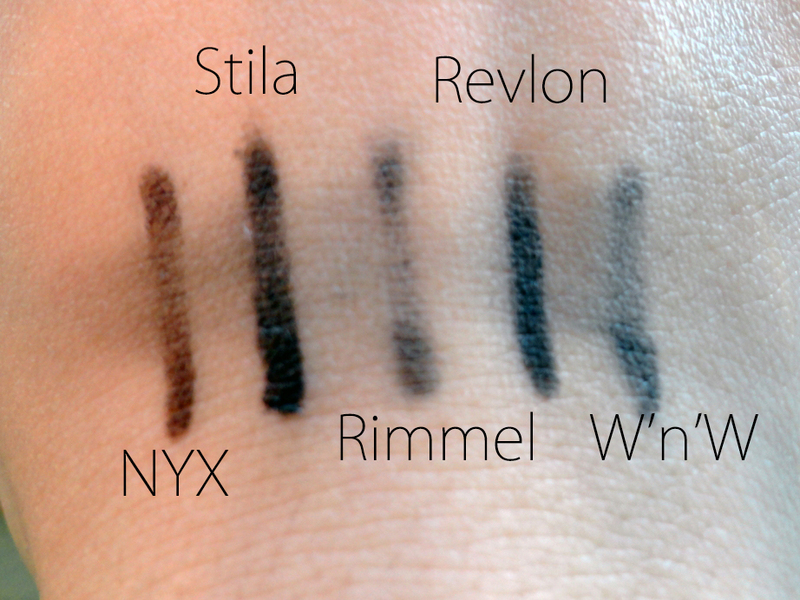 These are all either pencil or automatic eyeliners. As I was creating this post, I realised I've never seen beauty/makeup GIFs on blogs! Or is that just me? I hate recording myself and posting videos on Youtube, but I thought, hey, why not create GIFs for makeup swatches? That way, people don't have to loop/scroll back and forth to rewatch a swatch application! And voilà, I made my first ever GIFs! The only thing is, adding text to a GIF is still new to me, so it might be a bit hard to identify which GIF is which...maybe? First up, NYX Slide On liner in Brown Perfection! This medium brown pencil liner slides on like a dream! Creamy and pigmented, this brown is perfect for the lower lashline or days you want to swap the black for a lighter brown. Next up, Stila Smudge Stick in Damsel! This rich deep brown-bordering-on-black goes on even smoother than the NYX Slide On liner! Very, very pigmented and very creamy, mostly because it is meant to be smudged. This comes as an automatic liner. Here we have Rimmel Soft Kohl in Jet Black. Smooth and somewhat pigmented. Average, if you will. Comes in pencil form. And Revlon Colorstay eyeliner in Black. 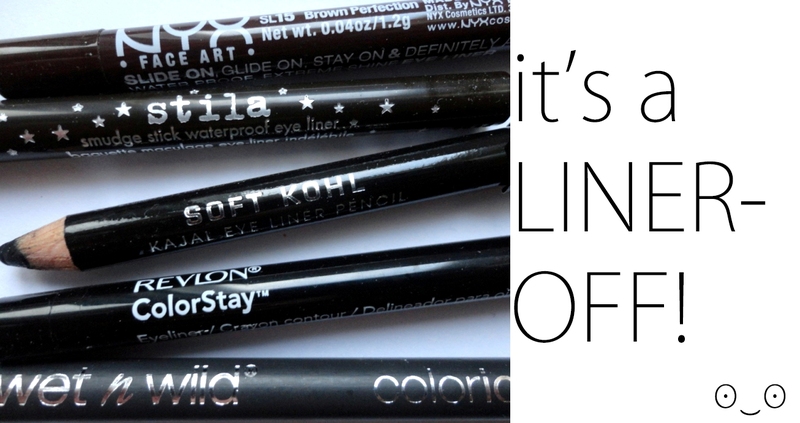 This GIF doesn't show it, but this automatic liner is actually of good pigmentation! Goes on quite smooth as well. Lastly, here is Wet n Wild Color Icon eyeliner Charcoal. You know what I hate? When my eye gets itchy and I need to rub it but I have eye makeup on. What's a girl to do? Rub her eye gently and strategically? What is this nonsense! My liner shouldn't smudge just because I have itchy eyes! But no, sadly, liners do smudge to various degrees. Poor Rimmel Soft Kohl took a heavy hit. Revlon and Stila managed to hold up pretty well though! You know what's another thing to be wary of? Tears. I hate to admit this, but when I'm in the theatre, sometimes I get teary-eyed--whether it's the loss of family or love portrayed on-screen, or the development of a relationship, I tear up. Or maybe I'll turn into Alex from Happy Endings and go full blown sobbing. I don't know. Whatever the case, I don't need evidence that I've been tearing up/crying! Sorry for the whackadoodle lighting! Oh poor Rimmel never stood a chance against the big league. Revlon turned out to be the bomb-diggity, though. 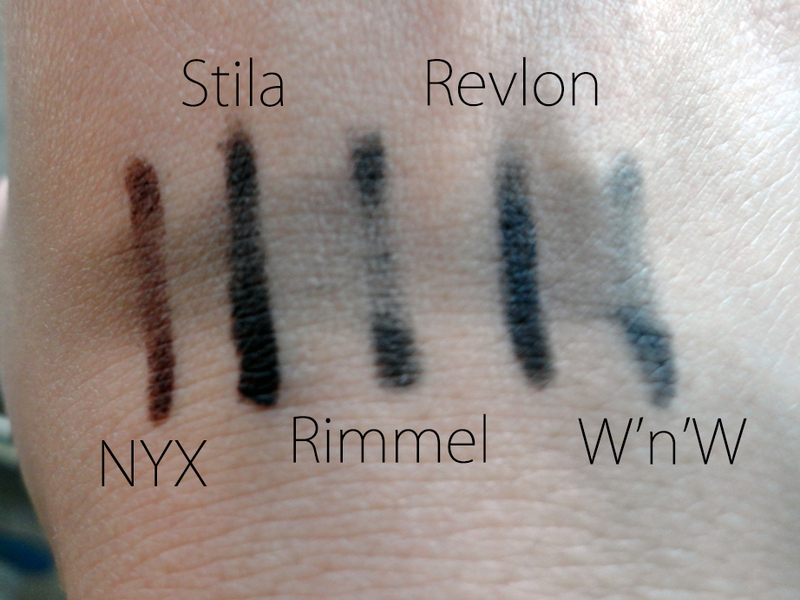 - Before this liner-off, I loved the Revlon eyeliner, and this test only made me love it even more. The only problem I have with this is that it's not the most heavily pigmented liner, and it doesn't glide on as smoothly as the NYX or Stila liner. 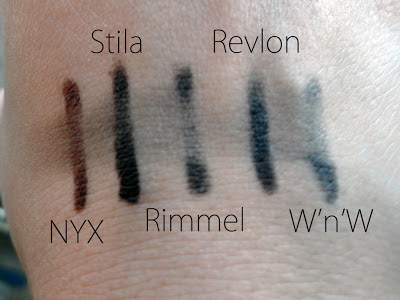 If Stila's Smudge Stick and Revlon's Colorstay eyeliner got busy and had a baby, that would be my holy grail liner. For now, I'll be content with what I have! - I had read so many positive reviews about Wet n Wild's Color Icon eyeliner, but honestly, that was the most difficult thing to use as an eyeliner. It was stiff, it tugged, but on the other hand, sometimes I use it as a brow pencil, and this liner was less than $2 CDN. 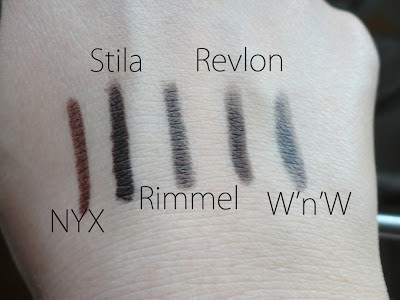 - If you do end up going drugstore or can't obtain Stila, NYX Slide On does have numerous coloured liners, as opposed to Revlon, which just come in a few basic 'classic' shades. That's all for this post! If you have any eyeliner recommendations for what I should try out, let me know! Hope you have a ~bomb-diggity~ Friday and weekend! I love the use of gifs! Original idea and very cool. And great comparison of the liners! I KNOW RIGHT? MAKING GIFS FOR EYELINER SWATCHES has to be my best idea, in like, 5ever. Maybe I'll try the Rimmel Exaggerate eyeliner after I run out of eyeliners, heh. I've heard wonderful things about the Milani Liquifeye liners and I will def. be picking one of those up whenever I find them!